Yes, we are just two weeks away from E3 2018. Want to be a part of the biggest game event of the year? 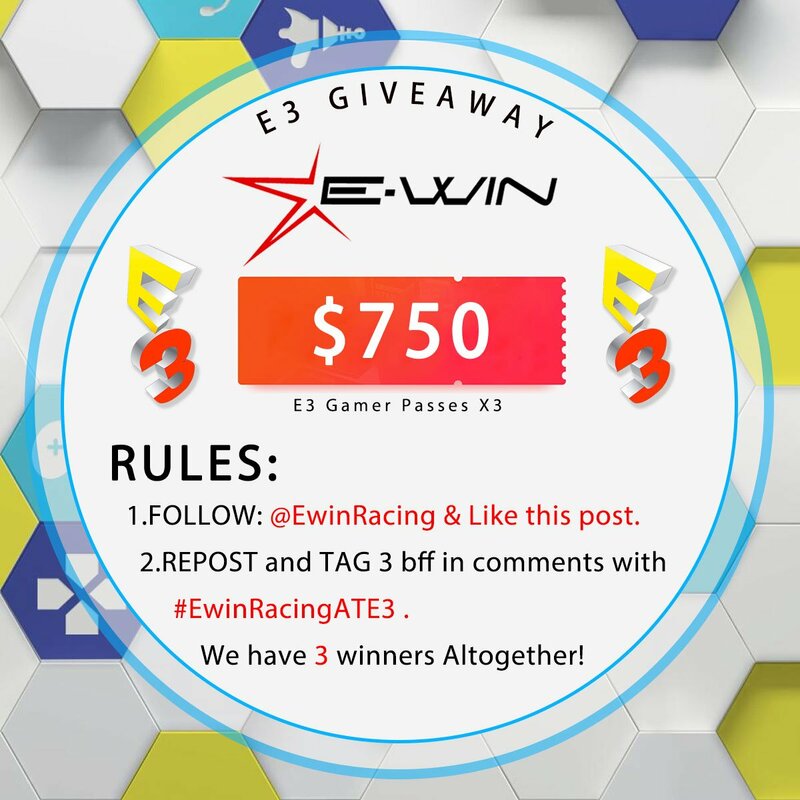 Here is a great chance to experience that greatness, EwinRacing is doing a big deal-E32018 Gamer Pass Giveaway, worth $750! GIVEAWAY END: June 10th, 2018. We have 3 winners altogether! Do not miss all the fun and excitement at E3 2018, the giveaway is on a limited basis. As someone who sits at an office desk all day long and sometimes night long, I know the importance of using a good chair. Sitting in subpar chairs can really tear your back up once you pull yourself away from your game or work. With that said, about two months ago, I started having some terrible problems with my back. I’m still not sure why there was a sudden onset of problems but suddenly – there it was — a horrible tightness in the middle of my back. It seemed as though no matter how I sat or moved around, I couldn’t get comfortable. A few years ago, I had invested in an ergonomic chair that I thought might last me for many years to come. As it turns out, the chair was exacerbating the back problem I now have. I’m not sure that it was the cause, but it wasn’t helping. That’s when I started looking into a new office solution for my aching back. I decided that looking closely at the gaming chair options that are available would be a good plan since they are made for long-term use. That’s when I found the Flash XL Gaming Chair from EWIN and I fell in love. The Flash XL Gaming Chair has some great features to it. For starters, it’s built on a durable steel frame and is supported by a 120MM Class-4 Gas Lift as well as a metal 5-star wheelbase. The cushioning is made from cold molding foam (high-density memory foam). With it being an ‘XL’ size chair, it can support up to 330 pounds from its users. When you sit in it you feel the difference, between the high-quality foam and lesser quality chair stuffing. The Flash XL Gaming Chair has a lot of adjustments available that make it possible for you to have the just right feeling for your needs. Adjustable Height: Seat will raise and lower with the lever on the side. Back Recliner: Chair will recline between 85-155 degrees. Tilt & Lock Mechanism: The seat and back will tilt and lock into various positions. It’s installed with safety and a Class-4 gas lift piston. When I first received my chair I was bouncing off the wall to get it set up. The chair arrived in a very large box with the pieces of the chair individually wrapped up and packaged carefully so as not to damage them. There were major pieces of the chair pre-assembled, but the back and seat needed to be attached and then mounted to the wheeled base. All in all, assembly only took about 30 minutes. You are provided all the necessary tools for assembly and it comes together quite easily. I was a little concerned when I found a tear in the side of the back, but as it turns out, that was an opening for a structural screw to go into from the side bracket. Once the chair is assembled, it’s ready to use. There are no complicated instructions or special needs for the chair operation. You have the option to recline or move the armrests around as you like – they are fully articulating. The seat cushion is firm but very comfortable. The pillows are supportive and make a real difference if you are sitting for long periods of time. I have been very impressed by the wheels. I know that sounds a little odd given the fact that it’s a gaming chair, but usually, the first things that break on me are the wheels of a chair. They are large, wide and roll around effortlessly on the carpet. I was met with a bit of a disappointment after getting my chair assembled due to one of the arms weld snapping off. The arm had basically fallen off. This was a big let down but as is the case with any product, you will find that not everything will be perfect. I reached out to EWIN support and they apologized for the unfortunate defect in the arm weld and offered to send out a brand new arm. They promptly sent a replacement and three days later, I had a new arm in-hand and my chair was as good as new. The XL size chair is made for taller people and can hold more weight than the average gaming chair. The chair has a variety of adjustments that can suit even the pickiest person – like me. The included pillows lumbar and head you would think that they might be a gimmick but I assure you they are not. I use these pillows to adjust myself in so many ways. I have had the opportunity to check out lots of cool chairs and gaming chairs over the years and the EWin Flash XL is just wonderful. I really enjoy the rocking ability that it has and have felt like I’ve been pretty much floating on clouds when using it. For anyone sitting long hours behind a desk no matter if you are gaming or doing office work, the EWin Flash XL will be a match made in heaven. Since I’ve had this chair, I’ve been able to sit comfortably for hours at a time and I’ve even noticed that my back problems are not as severe as there were before I started using this chair. It’s well-constructed, comfortable and it looks great! Find EWIN on Facebook and Twitter. NOTE: This is a review post from Macsources.